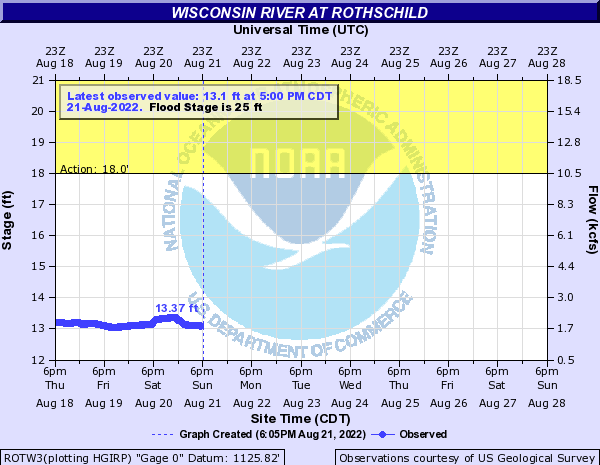 17.6' Floodwaters affect roads in Sauk County adjacent to the river. This level is considered to be about a 10 year flood. 17.0' Floodwaters affect cabins and trailers along Levee Road, Van Hoosen Road and Indian Trail Parkway in Sauk County. 16.0' There is flooding to agricultural land and wooded land. 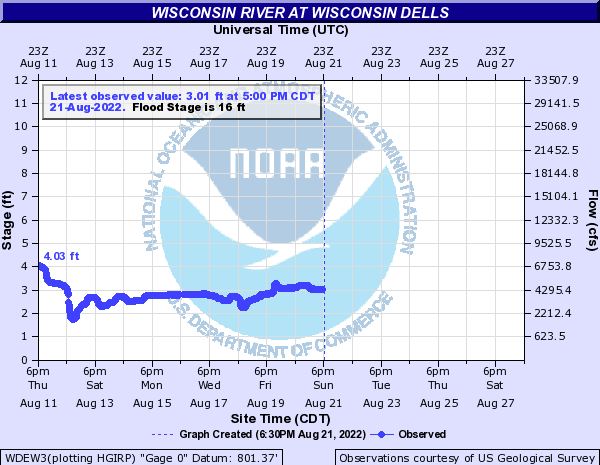 15.0' There is minor lowland flooding. This level is considered to be between a 2 year flood and a 5 year flood. 14.0' There is minor lowland flooding. This level is considered to be between a 2 year flood and a 5 year flood. 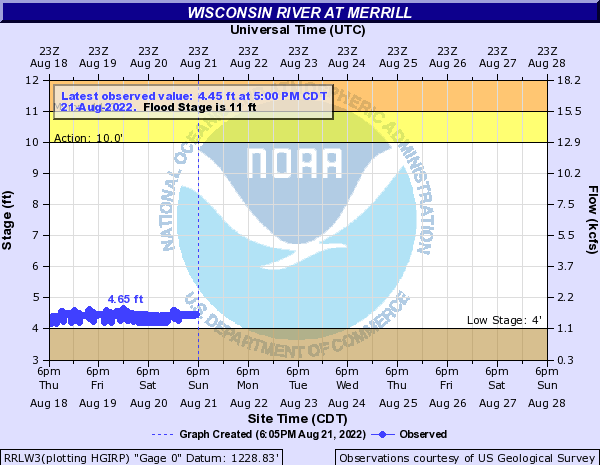 13.5' There is minor lowland flooding. This level is considered to be about a 2 year flood. 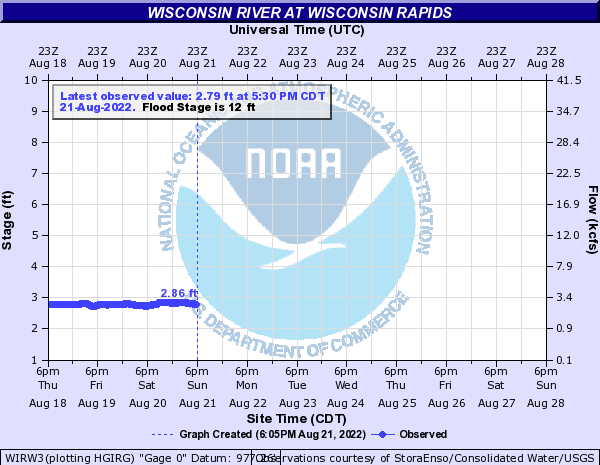 13.0' There is minor lowland flooding. 21.4' This level is about a 100 year flood. 20.9' This level is about a 50 year flood. 20.0' This level is about a 25 year flood. 19.2' This level is about a 10 year flood. 19.0' The U.S. Army Corps of Engineers is mobilized. 18.5' The levees in the Portage area are monitored and patrolled. 18.2' This level is about a 5 year flood. 18.0' There is evacuation of the residents of homes in the Blackhawk Park area. 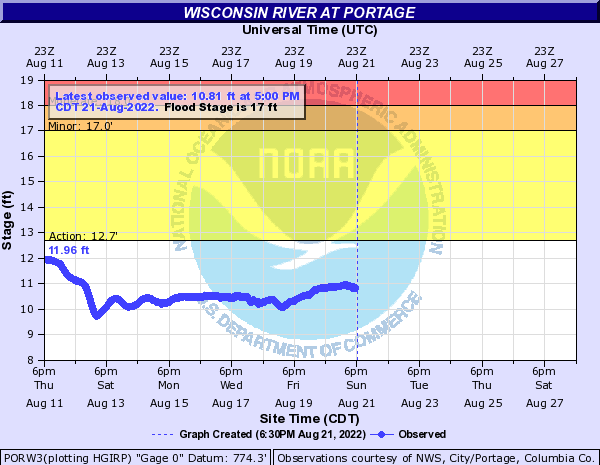 17.0' There is general overflow of the river and water is near homes in the Blackhawk Park area of Portage on the west side of the river. 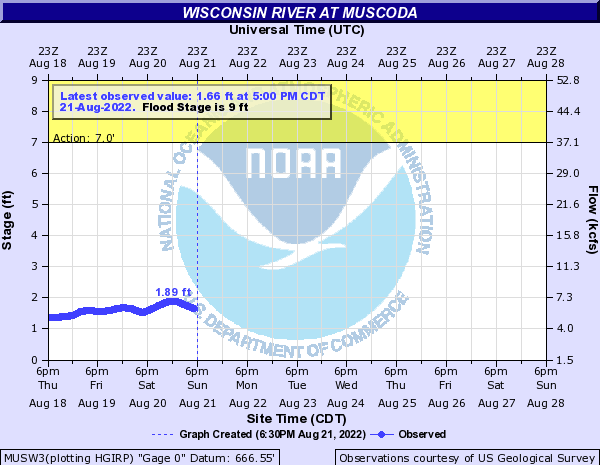 16.0' There is minor lowland flooding. 13.8' The river reaches the low steel on the Highway 80 Bridge over the river. 11.0' Widespread lowland flooding is likely... but the town of Muscoda should remain above the flood waters. 10.0' There is extensive lowland flooding... however no flooding has been reported in Muscoda in previous years. 9.0' The river begins to go out of its banks in some locations... with only minor flooding.